A perfect winter dish! It multiplies well for entertaining and is always a winner! 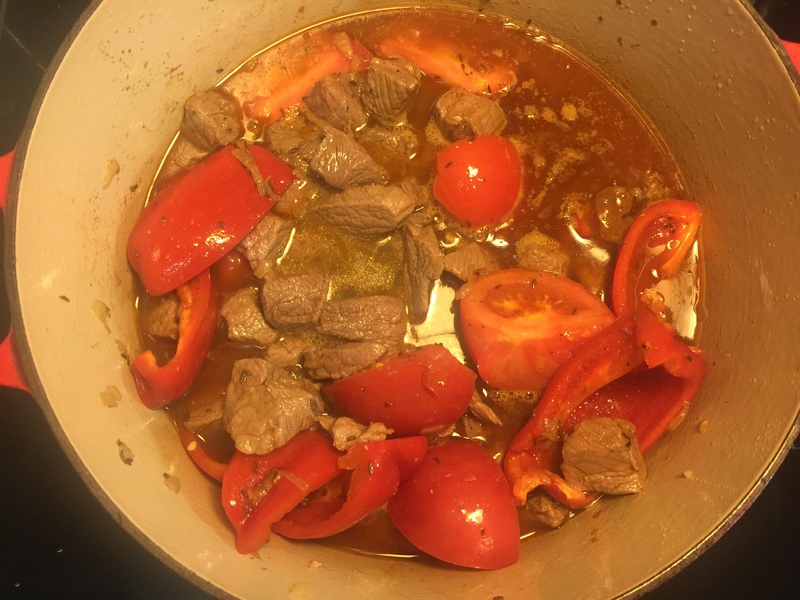 Hungarian Veal paprikas is a stew. 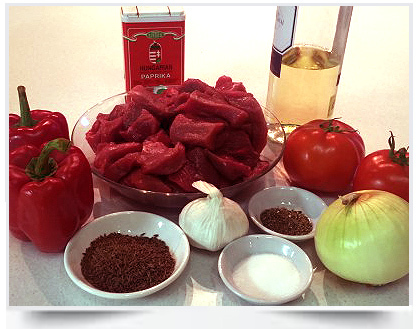 Do not mix it up with Hungarian goulash ( gulyás ). Which is a soup. You will sometimes see Porkolt written, which is the proper Hungarian word for paprikas. 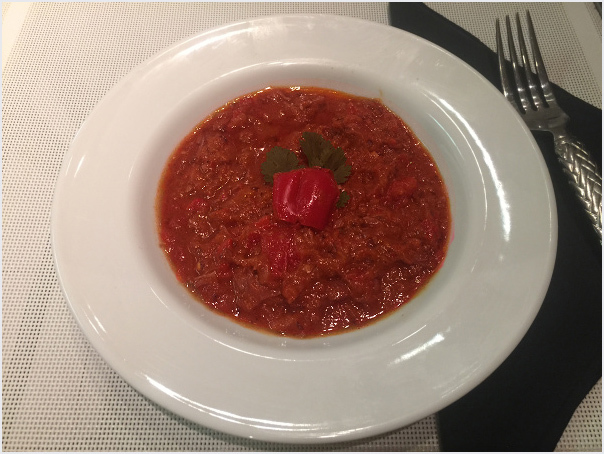 Veal Paprikash is another great dish you will want to add to your comfort food list. This recipe comes from my glamorous and clever neighbour, whose birthplace is Hungary. 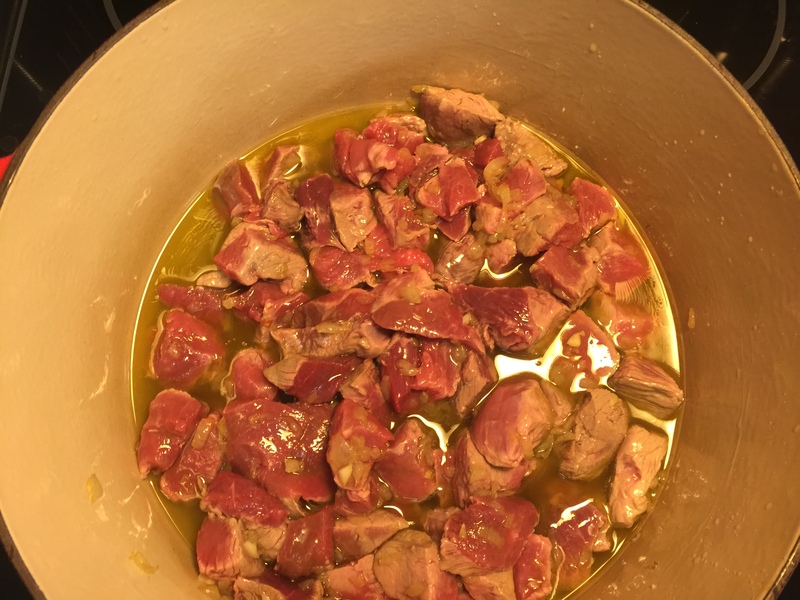 This ‘RECIPE’ hails from a ‘no recipe’ blend…. like many talented chefs! The ingredients are exactly the way that her mother made it back home in Hungary. Larger quantities are easy to make, when hosting a dinner party. Always a big hit with friends and family. The flavour satisfies many gourmands. My Hungarian neighbor is quite adamant about all the ingredients and the method. A traditional recipe at home in Hungary. A very popular ‘Heart Healthy’ dish! 1. In a heavy cast iron pot place onions and olive oil. Add more olive oil if necessary so that the onions are covered. Cook over medium heat until the onions are soft, stirring occasionally, about 10 minutes. 2. Add the veal and cook for another 5 minutes. 3. Add the other ingredients; tomatoes, paprika, caraway seeds, garlic,white wine and red pepper. Cover and simmer for one hour checking occasionally to make sure it is not boiling. If it is too watery, simmer uncovered for about 15 minutes. Add salt and pepper to taste. Aromatic “Health Smart” Sauce that is incredibly smooth. Serves 8-10. Leftovers are stored in the fridge or freezer or given to friends. A tasty treat to take home! PAPRIKA comes loaded with vitamin A and carotenoids along with vitamin E, iron and lutein. Vitamin A aids in night vision. Carotenoids gives paprika its deep red color plus preventing harmful light rays from damaging the eye tissues. Paprika pairs well with humus (chick peas), carrots, butternut squash and pumpkin soup. Caraway, also known as meridian fennel, or Persian cumin is common in European cooking for breads, cakes and added to pork roast (Germany, Austria and Hungary) and in Moroccan dishes. The flavor is nutty and bittersweet. FOOD TIP: Use paprika like salt. You can add paprika on “HOT” roasted potatoes and vegetables, right out of the oven. FUN STORY: I got this idea from a seaside shanty. Hot, curly fries with salt and paprika came out of the kitchen! The “chef” added it for you. (without me asking for paprika) Actually, they were amazing! (If you let the fries cool, even a little bit and add the paprika later ~ it was not the same taste). Oven veggies: add the paprika the last 5 minutes of baking, before you take them out of the oven to heighten the flavour. Do the same with roast chicken, scallops and more. CARAWAY seed comes from the parsley family. Grind it up and add it to your family coleslaw or potato salad and falafel (add very little ~ to taste). Caraway spice is a storehouse of minerals attacking free radicals in you body. I haven’t had this in years, your neighbors passed down recipe sounds terrific. We should use Paprika more often. Like carrots, it’s good for your eyes …and pleasant tasting. This really looks delicious. It’s great that a lot of people are getting more aware about eating and staying healthy. I think I’ll try this. I already did! I linked on Facebook. Great photos . Good photo~journey to you! What a lovely hearty meal. This reminds me of my Hungarian friends paprikash, just add nokedli! That’s actually a good idea! Thank you!